John J. Tobin was born circa 1925 at Wisconsin. He was the son of Francis Richard Tobin and Bertha Barbara Pluemer. John J. Tobin died before 1995. [S250] U.S. Federal Census 1930 U.S. Federal Census, by Ancestry.com, Year: 1930; Census Place: Potosi, Grant, Wisconsin; Roll: 2574; Page: 3B; Enumeration District: 49; Image: 715.0. Ewart Austin Earl Smith was born on 19 September 1895 at Canada. He married Margaret Beatrice Pluemer, daughter of William Pluemer and Anna Rebecca Mechler, on 23 September 1922. Ewart Austin Earl Smith died on 19 December 1957 at Chicago, Cook, Illinois, at age 62. Married Name Her married name was Salvolka. Married Name Her married name was Salwolke. Name Variation Valeria Maggie Mechler was also known as Valaria. Valeria Maggie Mechler married William J. Salwolke. Valeria Maggie Mechler was born on 19 October 1898 at Dutch Hollow, Grant, Wisconsin. She was the daughter of Bernard Mechler and Sarah Helbing. Valeria Maggie Mechler was buried in December 1976 at St. Mary's Catholic Cemetery, West Galena, Jo Daviess, Illinois. She died in December 1976 at age 78. Leo George Wilbur Mechler was born on 17 February 1901 at Potosi, Grant, Wisconsin. Leo George Wilbur Mechler died before 1910. Henry B. Mechler was born on 31 March 1905 at Potosi, Grant, Wisconsin. Henry B. Mechler died on 11 September 1970 at Wisconsin at age 65. [S250] U.S. Federal Census 1930 U.S. Federal Census, by Ancestry.com, Year: 1930; Census Place: Paris, Grant, Wisconsin; Roll: 2574; Page: 5B; Enumeration District: 37; Image: 576.0; FHL microfilm: 2342308. [S373] U.S. Federal Census 1940 U.S. Federal Census, by Ancestry.com, Year: 1940; Census Place: Paris, Grant, Wisconsin; Roll: T627_4481; Page: 7B; Enumeration District: 22-37. Peter Simon Miller Jr. was born in February 1882 at Dickeyville, Grant, Wisconsin, also reported as Kansas or Nebraska. He was the son of Peter Miller Sr. and Minnie Biermann. Peter Simon Miller Jr. and Caroline Helbing were divorced before 1930. Peter Simon Miller Jr. died in February 1939. 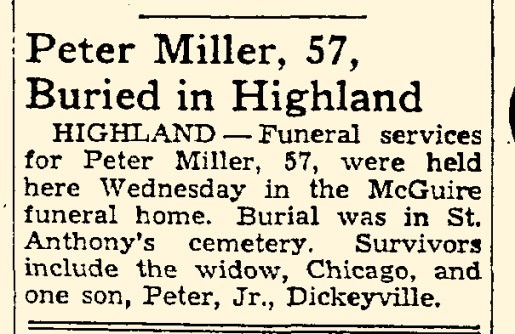 He was buried on 8 February 1939 at Saint Anthonys Cemetery Peter Simon Miller, 57, obituary. [S387] Family Search; Multiple Records, "Wisconsin, County Marriages, 1836-1911," database, FamilySearch (https://familysearch.org/ark:/61903/1:1:XRJ6-12Z : 3 June 2016), John Helbing in entry for Peter Miller and Caroline Helbing, 09 Jun 1903; citing , Grant, Wisconsin, United States, Wisconsin Historical Society, Madison; FHL microfilm 1,266,664. [S245] U.S. Federal Census 1900 U.S. Federal Census, by Ancestry.com, Year: 1900; Census Place: Paris, Grant, Wisconsin; Roll: 1790; Page: 8B; Enumeration District: 0047; FHL microfilm: 1241790. [S244] U.S. Federal Census 1910 U.S. Federal Census, by Ancestry.com, Year: 1910; Census Place: Cuba, Grant, Wisconsin; Roll: T624_1710; Page: 9B; Enumeration District: 0020; Image: 1078; FHL Number: 1375723. [S243] U.S. Federal Census 1920 U.S. Federal Census, by Ancestry.com, Year: 1920; Census Place: Platteville, Grant, Wisconsin; Roll: T625_1988; Page: 6A; Enumeration District: 120; Image: 369. [S250] U.S. Federal Census 1930 U.S. Federal Census, by Ancestry.com, Year: 1930; Census Place: Paris, Grant, Wisconsin; Roll: 2574; Page: 7B; Enumeration District: 37; Image: 580.0; FHL microfilm: 2342308. Name Variation Peter Simon Miller was also known as Peter Simmon. Peter Simon Miller was born on 14 July 1905 at Paris, Grant, Wisconsin. He was the son of Peter Simon Miller Jr. and Caroline Helbing. Peter Simon Miller married Mary Magdalena (?) before 1940. 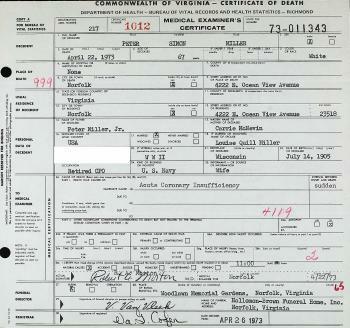 Peter Simon Miller married Louise Mary Quill on 13 April 1962 at Norfolk, Virginia, she is listed as widow; he is listed as annulled. Peter Simon Miller died on 22 April 1973 at Norfolk, Virginia, at age 67. He was buried after 22 April 1973 at Woodlawn Memorial Gardens, Norfolk, Norfolk City, Virginia. Peter Simon Miller obtained US Social Security Card at Iowa; last residence Norfolk, Norfolk City, Virginia. The marriage of Peter Simon Miller and Mary Magdalena (?) was annulled between 1942 and 1962. [S373] U.S. Federal Census 1940 U.S. Federal Census, by Ancestry.com, Year: 1940; Census Place: Dubuque, Dubuque, Iowa; Roll: T627_1159; Page: 11B; Enumeration District: 31-45. Name Variation Henry M. Jungels was also known as Jungles. Name Variation Henry M. Jungels was also known as Yungles. Henry M. Jungels was born in 1873 at Wisconsin. He was the son of Nicholas Jungles and Anna Mary Weber. 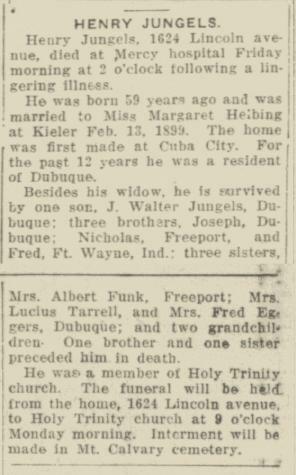 Henry M. Jungels died on 2 September 1932 at Dubuque, Dubuque, Iowa, Henry Jungels obituary. He was buried after 2 September 1932 at Mount Calvary Cemetery, Dubuque, Dubuque, Iowa. 1 January 1925 Dubuque, Dubuque, Iowa He appeared on the census of 1 January 1925 at Dubuque, Dubuque, Iowa. [S387] Family Search; Multiple Records, "Wisconsin, County Marriages, 1836-1911," database, FamilySearch (https://familysearch.org/ark:/61903/1:1:XRJX-WYV : 3 June 2016), John Helbing in entry for Henry Mary Jungels and Margaret Helbing, 13 Feb 1899; citing , Grant, Wisconsin, United States, Wisconsin Historical Society, Madison; FHL microfilm 1,266,664. [S244] U.S. Federal Census 1910 U.S. Federal Census, by Ancestry.com, Year: 1910; Census Place: Cuba, Grant, Wisconsin; Roll: T624_1710; Page: 4A; Enumeration District: 0020; Image: 1067; FHL Number: 1375723. [S243] U.S. Federal Census 1920 U.S. Federal Census, by Ancestry.com, Year: 1920; Census Place: Smelser, Grant, Wisconsin; Roll: T625_1987; Page: 4A; Enumeration District: 98; Image: 1034. [S250] U.S. Federal Census 1930 U.S. Federal Census, by Ancestry.com, Year: 1930; Census Place: Julien, Dubuque, Iowa; Roll: 654; Page: 4A; Enumeration District: 39; Image: 427.0. Name Variation John Walter Jungles was also known as J. Walter. Name Variation John Walter Jungles was also known as Jungels. Name Variation John Walter Jungles was also known as Walter. Name Variation John Walter Jungles was also known as Yungles. John Walter Jungles was born on 4 September 1900 at Smelser, Grant, Wisconsin. He was the son of Henry M. Jungels and Margaret Helbing. John Walter Jungles married Rufine Busch, daughter of Henry Busch and Mary Huske, before 1925. John Walter Jungles died in February 1978 at age 77. 1 January 1925 Dubuque, Dubuque, Iowa John Walter Jungles appeared on the census of 1 January 1925 in the household of Henry M. Jungels at Dubuque, Dubuque, Iowa. On 12 September 1918 at World War I Draft Registration, Grant, Wisconsin. John Walter Jungles was a teller at First National Bank in 1952. He and Rufine Busch lived in 1952 at 2017 Seminary, Dubuque, Dubuque, Iowa, surname listed as Jungels. Married Name before 1925 As of before 1925,her married name was Jungels. Married Name before 1925 As of before 1925,her married name was Jungles. Rufine Busch was born on 10 July 1902 at Wisconsin. She was the daughter of Henry Busch and Mary Huske. Rufine Busch married John Walter Jungles, son of Henry M. Jungels and Margaret Helbing, before 1925. Rufine Busch died on 27 May 1990 at age 87. Rufine Busch and John Walter Jungles lived in 1952 at 2017 Seminary, Dubuque, Dubuque, Iowa, surname listed as Jungels. Name Variation Nicholas Jungles was also known as Jungels. Nicholas Jungles was born circa 1829 at Germany. He married Anna Mary Weber on 21 February 1860 at Grant, Wisconsin. Circa 1864 at U.S. Civil War Draft Registrations, Grant, Wisconsin. [S247] U.S. Federal Census 1870 U.S. Federal Census, by Ancestry.com, Year: 1870; Census Place: Smelser, Grant, Wisconsin; Roll: M593_1717; Page: 450A; Image: 507; Family History Library Film: 553216. Name Variation Anna Mary Weber was also known as Anne Mary. Name Variation Anna Mary Weber was also known as Mary. Married Name 21 February 1860 As of 21 February 1860,her married name was Jungels. Married Name 21 February 1860 As of 21 February 1860,her married name was Jungles. Anna Mary Weber was born circa 1841 at Germany. She married Nicholas Jungles on 21 February 1860 at Grant, Wisconsin. Henry Busch married Mary Huske at Wisconsin. Henry Busch was born circa 1855 at Germany. Married Name Her married name was Busch. Mary Huske married Henry Busch at Wisconsin. Mary Huske was born circa 1860 at Wisconsin. Mary Jungles was born circa 1861 at Wisconsin. She was the daughter of Nicholas Jungles and Anna Mary Weber. John F. Jungles was born circa 1863 at Wisconsin. Name Variation Nicholas Jungels was also known as Jungles. Name Variation Nicholas Jungels was also known as Nick. Name Variation Nicholas Jungels was also known as Nicolas. Nicholas Jungels was born circa 1866 at Wisconsin. Nicholas Jungels married Mary Runde, daughter of Joseph Runde and Anna Maria Splinter, on 24 October 1893 at Grant, Wisconsin. Nicholas Jungels died in 1940. Peter Jungles was born circa 1868 at Wisconsin. Name Variation Joseph E. Jungels was also known as Jungles. Joseph E. Jungels was born circa 1869 at Wisconsin. Joseph E. Jungels married Theresa Runde, daughter of Joseph Runde and Anna Maria Splinter, on 27 June 1900 at Grant, Wisconsin. [S243] U.S. Federal Census 1920 U.S. Federal Census, by Ancestry.com, Year: 1920; Census Place: Smelser, Grant, Wisconsin; Roll: T625_1987; Page: 1A; Enumeration District: 98; Image: 1028. Married Name 24 October 1893 As of 24 October 1893,her married name was Jungels. Married Name 24 October 1893 As of 24 October 1893,her married name was Jungles. Mary Runde was born in 1866 at Wisconsin. She was the daughter of Joseph Runde and Anna Maria Splinter. Mary Runde married Nicholas Jungels, son of Nicholas Jungles and Anna Mary Weber, on 24 October 1893 at Grant, Wisconsin. Mary Runde died in 1954 at Wisconsin. Name Variation Theresa Runde was also known as Threse. Married Name 27 June 1900 As of 27 June 1900,her married name was Jungles. Married Name 27 June 1900 As of 27 June 1900,her married name was Jungels. Theresa Runde was born circa 1871 at Wisconsin. Theresa Runde married Joseph E. Jungels, son of Nicholas Jungles and Anna Mary Weber, on 27 June 1900 at Grant, Wisconsin. Name Variation Floyd N. Jungels was also known as Loyde. Floyd N. Jungels was born circa 1911 at Wisconsin. He was the son of Joseph E. Jungels and Theresa Runde. Joseph Runde was born on 23 October 1820 at Germany. He married Anna Maria Splinter on 25 November 1856. Joseph Runde died on 11 February 1894 at Wisconsin at age 73. Married Name 25 November 1856 As of 25 November 1856,her married name was Runde. Anna Maria Splinter was born on 18 November 1828 at Germany. She married Joseph Runde on 25 November 1856. Anna Maria Splinter died in 1910 at Wisconsin. Harvey F. Kieler was born on 25 July 1932. He was the son of Charles Henry Kieler and Josephine Ann Kunkel. Harvey F. Kieler married Mary C. Adam, daughter of Roy Adam and Lucille (? ), on 27 February 1954 at Dubuque, Iowa. Harvey F. Kieler died on 20 September 1997 at age 65 CUBA CITY, Wis. -Harvey F. Kieler , 65, 3928 Peddle Hollow Road, Cuba City, died at 11:10 a.m. Saturday, Sept. 20, 1997 at home, after a battle with cancer. Services will be at 10:30 a.m. Tuesday at Immaculate Conception Catholic Church, in Kieler , with Father Philip Krogman officiating. Burial will be in the church cemetery. Friends may call from 2 to 9 p.m. today at Haudenshield Funeral Home, Cuba City, where there will be a parish wake service at 7 p.m.
Harvey was a farmer all of his life. He was born and raised on and farmed the family farm his entire life. He was born July 25, 1932, on the family farm, son of Charles and Josephine Kieler . He married Mary Adam Feb. 27, 1954, at Sacred Heart Catholic Church, Dubuque. He was an Army veteran. In 1960, he was voted an outstanding farmer. He was an avid Packers fan, and enjoyed reading, playing cards and telling jokes with people. He enjoyed staying on the family farm. He loved his time spent with his children and grandchildren. He will be sadly missed and fondly remembered by all who knew and loved him. Surviving are his wife, Mary; six sons, Steven (Lisa), and Gregory (Carolyn), both of Cuba City, Jeffery, and Neil (Charlene), both of Dickeyville, and Kurt and Calvin (Diana), both of Cuba City; four daughters, Julia (Dale) Salzmann, Pamela Kieler , Patricia Kieler , and Rebecca Kieler , all of Dickeyville; 25 grandchildren; three brothers, Floyd, of Potosi, Charles, of Dickeyville, and Clair, of Hazel Green; a sister, Mary Ann Melssen, of Dickeyville; and many nieces and nephews. He was preceded in death by his parents; three brothers, Ambrose, Leander, and James; and a sister, Margaret Melssen. He was buried after 20 September 1997 at Immaculate Conception Church Cemetery, Kieler, Grant, Wisconsin. Married Name 27 February 1954 As of 27 February 1954,her married name was Kieler. Mary C. Adam was the daughter of Roy Adam and Lucille (?). Mary C. Adam married Harvey F. Kieler, son of Charles Henry Kieler and Josephine Ann Kunkel, on 27 February 1954 at Dubuque, Iowa. Married Name 25 November 1947 As of 25 November 1947,her married name was Kieler. Olive Ann Kruser was born before 1929. 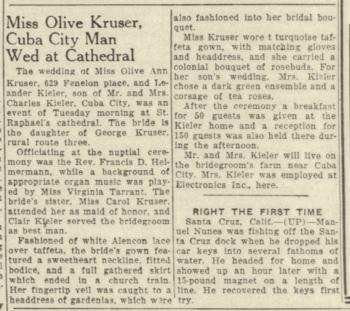 She married Leander Kieler, son of Charles Henry Kieler and Josephine Ann Kunkel, on 25 November 1947 Olive Kruser and Leander Kieler marriage announcement. Married Name Her married name was Kahle. Marcella V. Droessler married (?) Kahle. Marcella V. Droessler was born circa 1904 at Iowa. She was the daughter of Valentine Droessler and Anna Margaret Thor. Marcella V. Droessler died before 2004. [S243] U.S. Federal Census 1920 U.S. Federal Census, by Ancestry.com, Year: 1920; Census Place: Jamestown, Grant, Wisconsin; Roll: T625_1988; Page: 3B; Enumeration District: 106; Image: 27. Married Name Her married name was Donahue. Loretta M. Droessler married Harry Donahue. Loretta M. Droessler was born circa 1907 at Dickeyville, Grant, Wisconsin. Loretta M. Droessler died in March 1966 at Mercy Hospital, Dubuque, Iowa. George W. Droessler was born circa 1912 at Wisconsin. He was the son of Valentine Droessler and Anna Margaret Thor. George W. Droessler died before 2004.